Where the Wild West Lives! 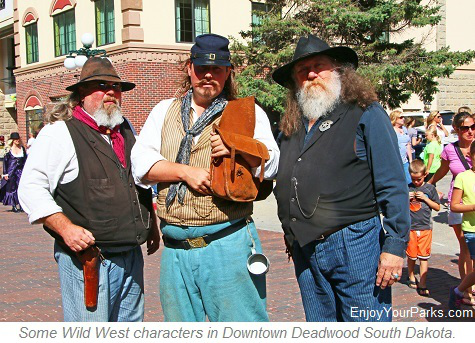 Deadwood South Dakota is without question among the top historic "Wild West Towns" in America, and is undoubtedly a "must see" during your South Dakota vacation. 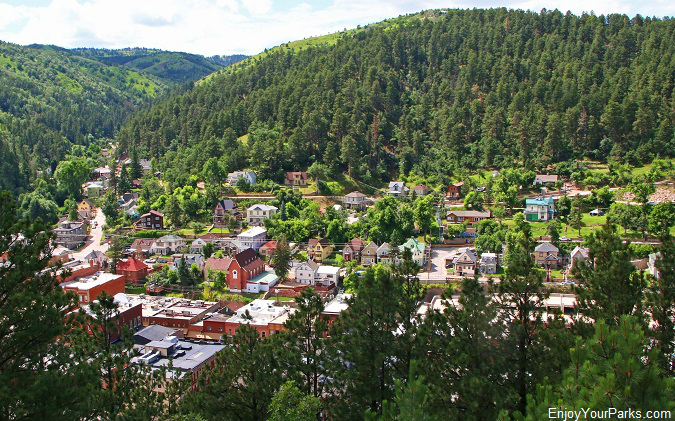 Founded in 1876 during the height of the Black Hills Gold Rush, Deadwood South Dakota is a "Living Ghost Town" where nearly the entire town is on the National Register of Historic Places. 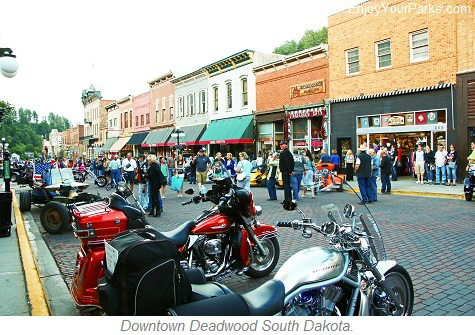 Accurately restored, downtown Deadwood South Dakota is truly a sight to see.... and you'll swear you jumped into a time capsule and ended up in Deadwood South Dakota during its boom days in the mid 1870s. 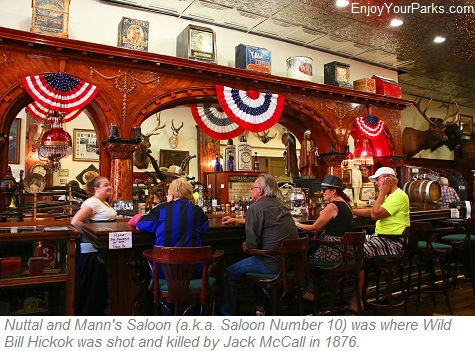 Located in the heart of the Black Hills of South Dakota, Deadwood was a classic Old West Gold Rush Boomtown.... with brothels, saloons, gunfighters, miners and gamblers. 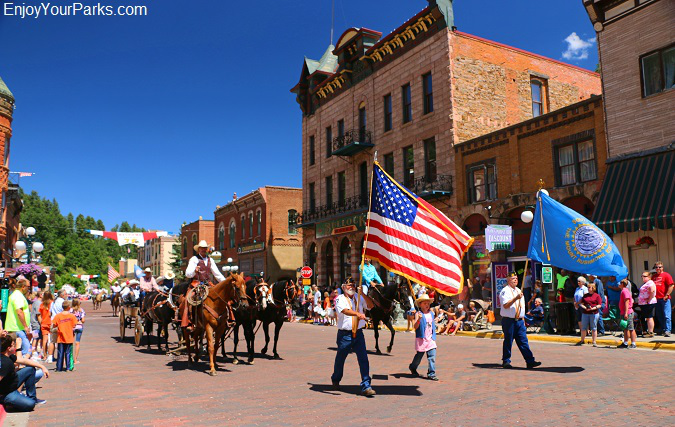 Put another way, what you'd see in a movie about the Wild West happened for real in the gold rush town of Deadwood South Dakota. Today, Deadwood is a major tourist attraction, where much of the town is part of the Deadwood National Historic Landmark District. Deadwood definitely had its share of famous Wild West personalities either living there or were frequent visitors.... The two most famous were Wild Bill Hickok and Calamity Jane. Other notables included Aaron Dunn, the Reverend Henry Weston Smith, Dr. Valentine McGillycuddy, Samuel Fields, Martha Bullock, Seth Bullock, A.W. Merrick, Charlie Utter, Sol Star, E.B. Farnum and Al Swearengen. Though there are countless stories and legends associated with early Deadwood South Dakota, mainly due to its utter lawlessness, but probably the most famous occurrence in Deadwood was when Jack McCall shot and killed the legendary gunfighter and gambler Wild Bill Hickok alegedly in the back, who was buried in the Mount Moriah Cemetery in Deadwood next to Calamity Jane and still is. McCall was prosecuted twice even though the U.S. Constitution protects its citizens from "double jeopardy". He was acquitted the first time, but found guilty of murder and hung the second time. And an interesting note about Calamity Jane... she was actually a Montana gal who was visiting the Deadwood area when she took ill and died, and it is very unlikely she ever met Wild Bill Hickok even though history has painted Wild Bill Hickok and Calamity Jane as close long time friends. 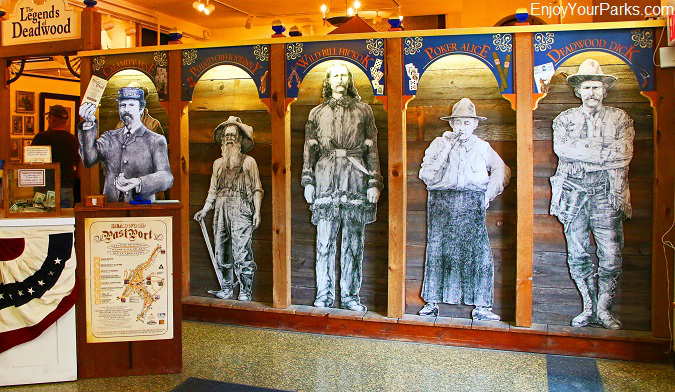 Some of the legends of Deadwood... which include Wild Bill Hickok and Calamity Jane. found in the creeks of the Black Hills, triggered the legendary Black Hills Gold Rush which nearly overnight created the lawless Wild West town of Deadwood South Dakota. 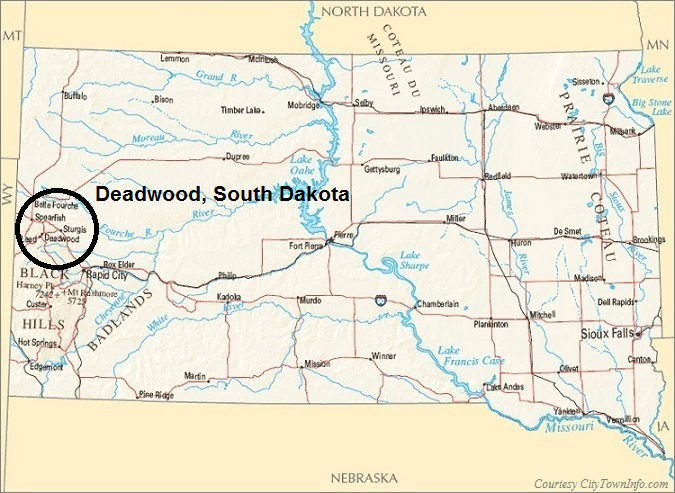 In a very short period of time Deadwood reached a population of about 5,000 miners, merchants, saloon operators, robbers, gunfigters, gamblers, saloon operators, snake oil salesmen, bankers, madams, prostitutes, and every other type of person and occupation you could possibly envision living in a classic old west mining town. But as all gold rush boom towns experience.... the bust came shortly after the boom. In 1879 the placer gold production in the creeks around Deadwood began to diminish, and a catastrophic fire burned over 300 buildings to the ground. 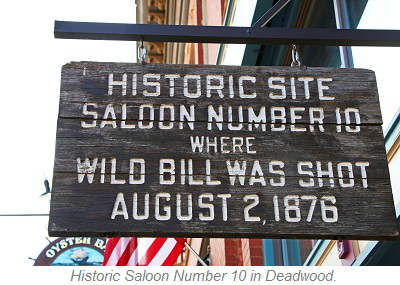 Many of its residents left Deadwood after that to start a new life elsewhere, but thankfully a fair number of residents stayed and kept the Wild West town of Deadwood alive. As the residents rebuilt the town of Deadwood, many of these historic buildings and houses remained standing through the years, and today practically the entire town of Deadwood... even beyond its legendary main street, is riddled with buildings listed on the National Register of Historic Places. 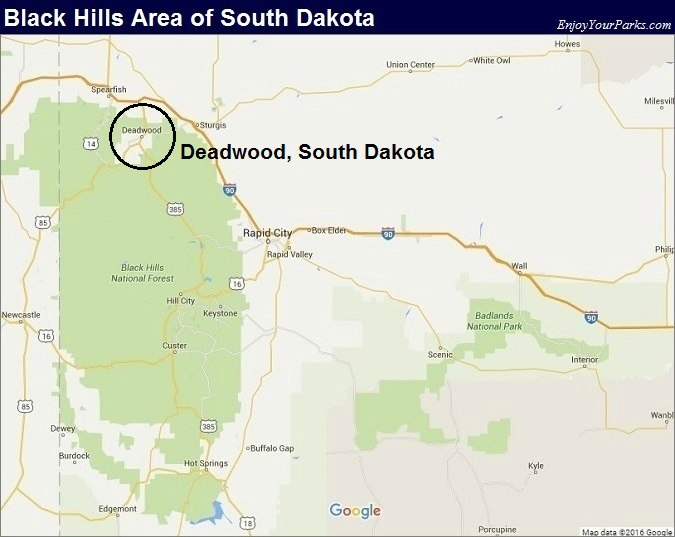 And practically the entire town is part of the Deadwood National Historic Landmark District. Places, and are incredibly restored to accurately capture the flavor of the Wild West. 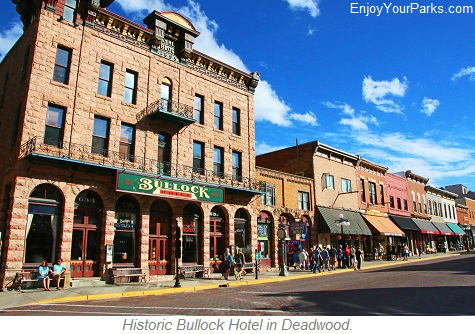 Deadwood South Dakota is a major Black Hills tourist destination with incredible lodging which includes amazingly historic (and some say haunted) hotels, fantastic dining and wonderful shopping. Gambling is also extremely popular in Deadwood, where there are several gambling establishments found on main street and beyond. 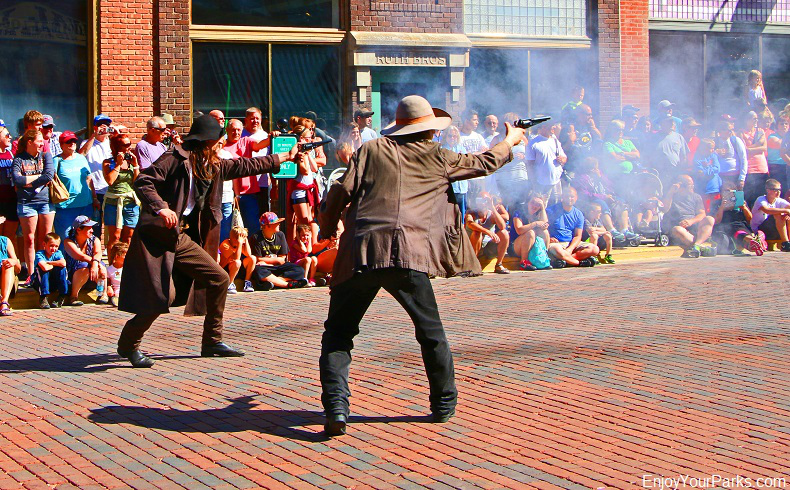 There are outstanding historic tours provided in Deadwood, fascinating museums, and the Mount Moriah Cemetery in Deadwood is where you can pay your respects to some of the notable historic Deadwood Legends such as Wild Bill Hickok and Calamity Jane. An interesting feature of Deadwood is its prominent Victorian architectural influence, which was typically the case for most Old West towns during this period of time in Western history. 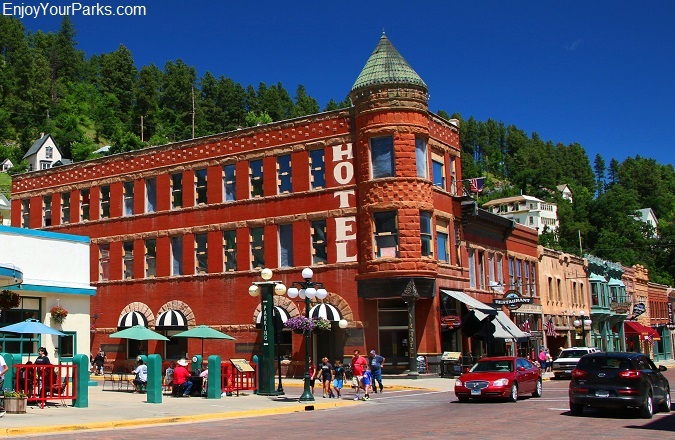 Built in 1895 by Seth Bullock, an early Deadwood sheriff, along with his business partner Sol Star, the Bullock Hotel is the oldest hotel in Deadwood. Located on the corner of Main Street and Wall, the Bullock Hotel is wonderfully restored to its near-original appearance, and has a casino, restaurant and 28 of the original 63 rooms are open for business. Now of course there are rumors of the Bullock Hotel being haunted... mainly by Seth Bullock himself. Mr. Bullock died in September 1919 in room 211, and there have been countless reports of eery occurance that are attributed to the ghost of Seth Bullock. His ghost has been reported to even touch people...but not injuring them... and due to this ghostly notoriety, the Historic Bullock Hotel has regular ghost tours, and was featured on the TV show Ghost Adventures on a special Halloween episode in 2015.
did with his back against the wall, facing face the front door of the Saloon to avoid a vulnerable attack. The poker player (Charlie Rich) refused to move, so Hickok had his back to the front door. McCall entered, walked up to Wild Bill Hickok and shot him in the back of the head with a .45 caliber revolver, yelling "Damn You! Take That!" 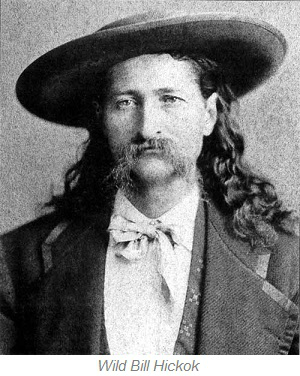 Wild Bill Hickok, who was admired and liked by most of the residents of Deadwood, died at the poker table. He was holding his poker hand, which was a pair of Aces and a pair of Eights, all black, which is now known as the "dead man's hand". 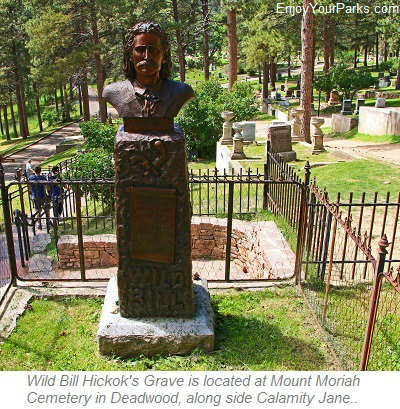 Wild Bill Hickok's grave is located at the Mount Moriah Cemetery in Deadwood, alongside Calamity Jane. McCall was prosecuted twice for his crime... which is known as "double jeopardy" and is forbidden under the U.S. Constitution. The first trial he was acquitted, the second trial he was found guilty, hanged and buried with the noose still around his neck. 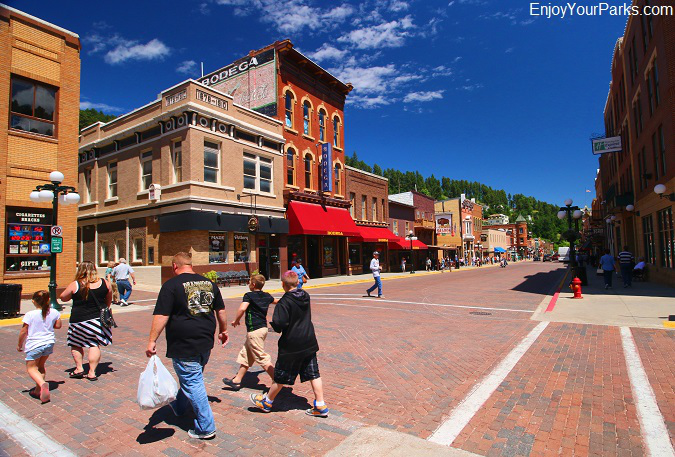 Visitors enjoying Downtown Deadwood South Dakota. The George Mickelson Trail was originally a railway and was converted into a hiking trail that extends 108 miles from Deadwood South Dakota to Edgemont, with about 9 additional branch trails that include a 3 mile paved trail from the town of Custer to Custer State Park. Hill City and Lead are also towns connected by this trail system. Most of this trail system of the George Mickelson Trail follows the original route of the historic railroad branch line built in 1890 by the Chicago, Burlington and Quincy Railroad. The railroad was last operated by the Burlington Northern, and was abandoned in 1983. The George Mickelson Trail includes 4 tunnels and many scenic traverses as it cuts through mountains and forests. There are also over 100 railroad bridges that have been converted, and 15 trailheads found along the route that takes hikers into the Black Hills National Forest. So if you like to hike, the George Mickelson Trail is definitely a "must see and explore" during your time in Deadwood and the Black Hills of South Dakota. In 1877, near Deadwood South Dakota at the mining town of Lead, South Dakota, which actually endured and became the longest continuously operating gold mine in America. When the Homestake Mine ended its operations in 2002, it has remained open for tourists to explore and enjoy. Deadwood South Dakota was founded in 1876, and nearly the entire town is listed on the National Register of Historic Places.